According to the Internet, bronies celebrate values espoused on MLP:FIM—teamwork, tolerance, etc. So maybe it is actually a bad thing that no one has taken a tab from this flyer hanging in Parker Hall. Anypony with nothing else to do on a Friday night <ahem> ought to check it out. Neigh-sayers need not apply. Here’s a Plainsman story on the club. Some female fans are called Pegasisters. 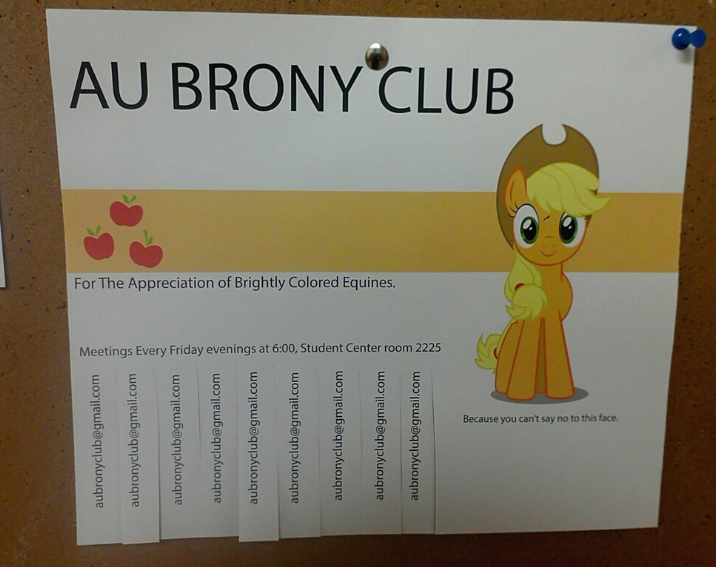 Some prefer to be called Bronies. Can we just forget this ever happened? Seriously…..
We can’t forget such a awesome show!